We appear to be in that strange no man's land where summer is over but it's not quite autumn yet. The weather is so varied. It's really cold first thing in the morning but hot and sunny by the afternoon. I'm not really complaining as I love the sunshine and am pleased it's not raining. I just think it's contributing to me feeling so unsettled and anxious at the moment. I will probably be complaining how miserable I am because it's raining by next week! What I am loving though is that it is conker season. I love conkers, they are so shiny and pretty. In fact I think I like collecting them more than my kids do. I have been picking up lots recently to keep on the windowsils to keep the spiders out. Probably just an old wive's tale but I am not taking any risks. I had to use this photo. 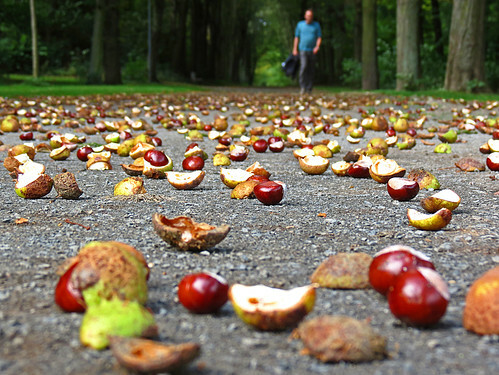 Just look at all those conkers. I have never seen so many lying on the floor like that. Usually by the time I get to them they have been collected already or squashed. I wonder if that man in the background will be tempted to pick up a handful himself. Surreal isn't it. I am sure I am usually in boots, coat and scarf collecting conkers. It's cold and wet here so it definitely feels like Autumn! I've never heard that putting conkers on the window sill will keep spiders out. I'm going to try it! Anything to keep them out!